As a plaintiff’s personal injury trial lawyer in Atlanta, Georgia, I have tried many personal injury cases on behalf of very deserving clients. My job is to persuade the jurors my client is deserving of money damages to compensate them for the injuries they have received that may be permanent, something they’ll have to deal with the rest of their lives. The best way to convey this message, quite simply, is to ask the jurors to put themselves in your client’s shoes and see how they would feel, right? But did you know in Georgia, in personal injury cases, I am forbidden from even making that argument to the jury? Doesn’t make alot of sense, does it? But Georgia Law limits what I can say and it would be error for me to use what is often referred to as The Golden Rule, i.e., asking the jurors “how they would feel” if this horrible injury had happened to them. Now that’s in a personal injury case in which your client survived whatever tragedy befell them. In a wrongful death case in Georgia, it’s different, because the law in Georgia regarding the measure of damages in a wrongful death case is “the full value of the life of the decedent, from the decedent’s perspective.” So this necessarily means I must ask the jurors to see things from the perspective of the person who died to be able to place a value on his or her life. 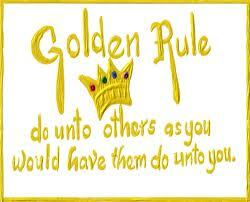 Defense attorneys often attempt to limit my argument in a wrongful death trial citing The Golden Rule. They often cite a Georgia case for authority for their position, Myrick v. Stephanos, 220 Ga. App. 520 (1996), which is not a wrongful death case. It was a tractor-trailer wreck case involving severe personal injury to the plaintiff. But the plaintiff lived. The measure of damages in a personal injury case are different than in a wrongful death case. Damages in a personal injury case in which the injured plaintiff is living is not measured from the perspective of the plaintiff. This is why the Myrick court reversed the trial court on the basis of the “Golden Rule” argument made by Plaintiff’s counsel. The Myrick court note that such an argument in a personal injury case “is improper because it asks the jurors to consider the case, not objectively as fair and impartial jurors, but rather from the biased, subjective standpoint of a litigant. 75A AmJur2d, Trial, § 650 (1991).” Myrick v. Stephanos, 220 Ga. App. 520, 522, 472 S.E.2d 431, 435 (1996). This is not a concern in a wrongful death case. The Georgia Wrongful Death law actually requires a jury to place themselves in the shoes of the decedent to ascertain damages properly. “It is clear, also, that under Georgia’s wrongful death statute, damages are measured from the decedent’s point of view. A child’s right to recover for his mother’s death ‘is a substitution of the [child] in [her] place for the purposes of recovering for the injury inflicted upon [her].’ Atlantic &c. R. Co. v. McDilda, 125 Ga. 468, 471, 54 S.E. 140 (1906). See also Reliance Ins. Co. v. Bridges, 168 Ga.App. 874, 887(15), 311 S.E.2d 193 (1983) (physical precedent only). In other words, the measure of damages is not a son’s loss from his mother’s absence, but the mother’s loss from not being able to raise her son.” Brock v. Wedincamp, 253 Ga. App. 275, 280-81, 558 S.E.2d 836, 841 (2002). In a wrongful death case, asking the jury to view things from the decedent’s perspective is proper and is not an appeal to sympathy but is simply explanation of how they are to award damages for the “full value of the life of the decedent from the decedent’s perspective.” See Naimat v. Shelbyville Bottling Co., 240 Ga. App. 693, 698, 524 S.E.2d 749, 754 (1999) (“Rather, it lawfully directs the jury’s attention to the question for decision under the proper objective standard established by OCGA § 51-1-2.”). “The ‘full value of the life of the decedent’ consists of two elements, the economic value of the deceased’s normal life expectancy and the intangible element incapable of exact proof. See Cobb and Eldridge, Georgia Law of Damages, § 37-2, p. 714; see generally City of Macon v. Smith, 117 Ga.App. 363(8), 160 S.E.2d 622 (1968). Therefore, [i]n arriving at the value of the life of the decedent the jury is not bound to find that lifetime earnings reduced to present value is the full value of the life of the decedent, but such is an aid only to the jury in making such determination. (Citations omitted.) A-1 Bonding Svc. v. Hunter, 125 Ga.App. 173, 180(5), 186 S.E.2d 566 (1971). The intangible factors which supplement the economic value to comprise the full value of the decedent’s life elude precise definition, particularly in situations such as the instant one in which the decedent was employed and thus a basis exists for determining the loss. Compare Reliance Ins. Co. v. Bridges, 168 Ga.App. 874, 886(15), 311 S.E.2d 193 (1983). Miller v. Jenkins, 201 Ga. App. 825, 826, 412 S.E.2d 555, 556 (1991). See also S. Fulton Med. Ctr., Inc. v. Poe, 224 Ga. App. 107, 112, 480 S.E.2d 40, 45 (1996) (“the full value of the life of the decedent includes both the economic value of the deceased’s normal life expectancy and the intangible element incapable of exact proof, such as as a parent’s society, advice, example and counsel. (Citations and punctuation omitted.) Consolidated Freightways, 201 Ga.App. at 233(1), 410 S.E.2d 751; Miller v. Jenkins, 201 Ga.App. 825(1), 412 S.E.2d 555 (1991). Here, contrary to South Fulton’s contentions, the court did not charge the jury as to the Poes’ losses, but properly charged the jury regarding the full value of the infant’s life.”). Not all states handle wrongful death cases like this, but Georgia takes a unique position. Although we may not be able to use the very words “put yourself in the plaintiff’s shoes,” we can use the testimony of family and friends to show how valuable the plaintiff’s life was and why the jury should do justice for the family. A trial lawyer hopes the jury will have enough empathy to know what is right and what is just for the family. Robin Frazer Clark pursues justice for those who have personal injury claims as a result of being injured in motor vehicle wrecks, trucking wrecks, defective products, defective maintenance of roads, medical malpractice and other incidents caused by the negligence of others. Ms. Clark is the Past President of the State Bar of Georgia and the Past President of Georgia Trial Lawyers Association and has practiced law in Georgia for 25 years. Mrs. Clark is listed as one of the Top 50 Women Trial Lawyers in Georgia and is a Georgia Super Lawyer.